GRAFENWOEHR, Germany – The male Soldier-Athlete of the year is Sgt. 1st Class David L. Moore stationed in Grafenwoehr, Bavaria. Moore, a platoon sergeant with Echo Forward Support Troop, Regimental Engineer Squadron, 2nd Cavalry Regiment, have been selected by the All-Army Sports Office. “It’s humbling to represent the Army and myself and all the athletes,” said Moore. 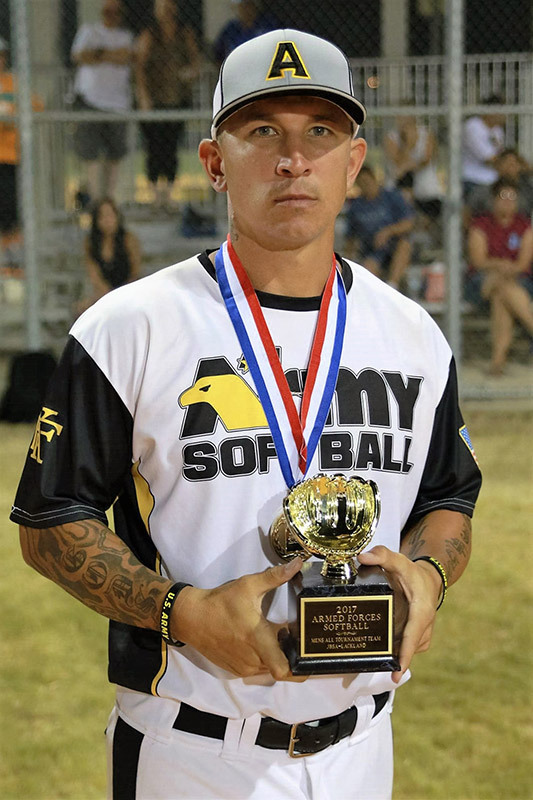 The Male Soldier-Athlete of the year also was selected for 2017 Men’s All Army Softball selection, the All Armed Forces softball selection, the All Armed Forces Softball team captain and more. “In order to increase your fitness and to improve your health it takes more than just the day to day PT. I go to them gym every day to strengthen my body. Eating healthy is also a big part. The stronger you are, the stronger you make your body,” Moore said. A strong body and healthiness is the requirement for readiness and deployability. The USAG Bavaria just kicked of the Bavarian Health Initiative which covers all facets of fitness, well-being and nutrition. With all his success in sports, Moore is very thankful to his leadership who supports his career as a soldier and as a sportsman. Some of the competitions takes him out of the unit 30 to 50 days. He appreciates their support. Being a mentor for others is part of Moore’s life. “In softball I have random people come up and ask what they need to do to improve their game. I watch them play and help to tweak their game to improve it,” said Moore. He also has referred five Soldiers to attend All Army Softball Camp and all five Soldiers have become part of the All Army Softball Team. Moore’s team won the Europe Slowpitch Softball League tournament competed against about one dozen international teams. The Miami native enjoys international partnerships in sports and outside of sports. He volunteered 96 hours during the annual German-American Volksfest in Grafenwoehr, one of the largest German-American partnership events in Europe. Moore doesn’t stop his motivation, “my next challenge gonna be golf. I play since I’m in high school and I want to excel in golf.